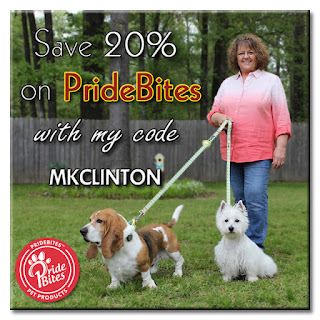 PrideBites is famous for making amazing products that pet parents can design and personalize for their best friend. My new towel was no exception. The entire process was so simple that Mom could have done it without my help. All you do is select the color, font, font background and add the photo. The towel will arrive in approximately 3-4 weeks so now is the time to order for that beach vacation with your pup! Let's face it... towel is FABULOUS! Wait until Bentley sees me drying off with MY very own towel. It not only has Pierre written in big letters but there is a photo of me too! We chose the HD Photoreal but you can still opt for the hand-drawn image. Mom thinks it is amazing! 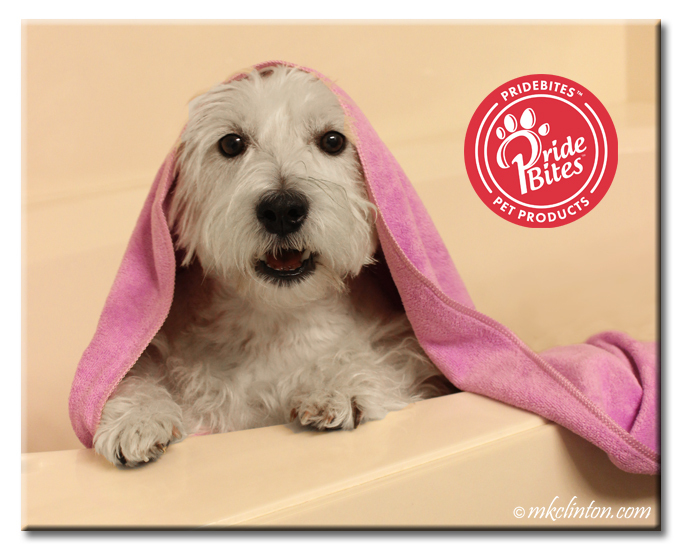 PrideBites’ towels are made from high-quality, machine washable, microfiber material. They are the perfect weight and thickness. As far as absorbency goes, I can be dry in no time at all. It is much quicker than our regular cotton towels. Plus, it has MY NAME AND FACE ON IT!!!!! I love it so much! Excuse me now because I must go prance in front of Bentley with my towel wrapped around me. He is going to be sooooo jealous! Pssst…my 7th birthday is April 17th and PrideBites will be part of the pawsome birthday celebration giveaway! Mark your calendars now. Please join us for the Pet Parade Blog Hop! It’s a great way to discover new blogs and friends. 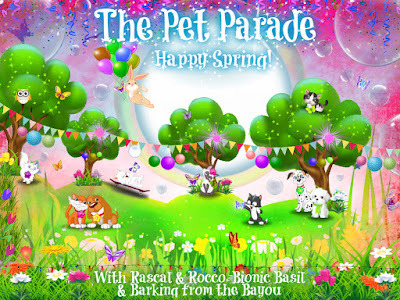 Rascal & Rocco, Bionic Basil's Blog and I would love the have you hopping along! oooh that is super cool! I want a towel too... I can use it for a bath without water too right? Whoa! That is one SuperSpecial towel, Pierre! I love it! Bailie, aka purple girl, loves the color of towel you chose! Stay dry, LOL! Wow...that is one mighty fine towel. You'll be the talk around the bathtub, Pierre! We didn't think we would ever get excited by a towel. We were wrong. What a handsome dude on that towel! Boy, you doggies really know how to live. Monogramed paw towels and diamond collars are next! Those purrsonalized towels are fantastic! That is a great towel!! And no mistaking who it belongs too! Pierre! What a pawsome towel! Your Barkday is coming up & you're having a giveaway! 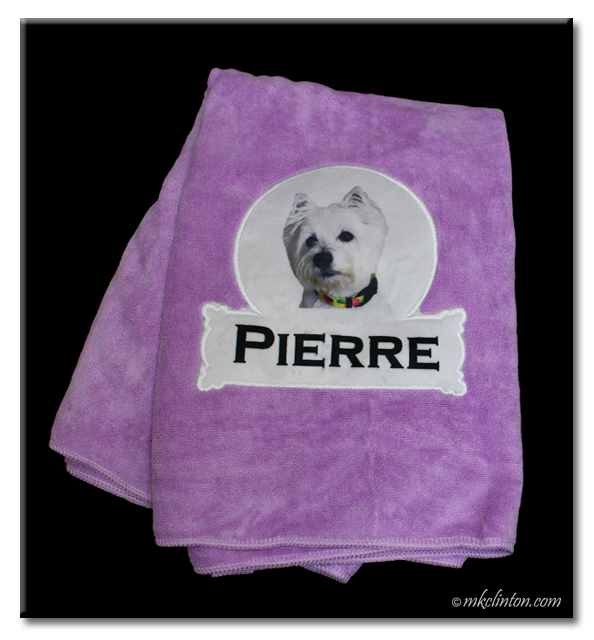 Only the most very special dogs have towels with their photos and name on it, Pierre! You are one special and lucky boy! Wow that is a super cool towel!